Some of you may not know that, last year, Delphi took the reins of the GLOBE Series, the Leadership Summit on Sustainable Business. We’ve been a partner of the GLOBE Foundation for years, so when Delphi had an opportunity to take over the event planning arm, it felt like a natural progression and something we could not pass up. There was a lot of good stuff to work with. An established reputation as the premier sustainability conference in Canada, if not the world; a strong focus on the intersection between business and the environment; strong partnerships; and an excellent team. We knew we wanted to up the ante. Make it more about transactions. About innovation and technology. About continuing the conversation and convening the community in the two-year gap between conferences. So we brought you… GLOBE 2016. It will come as no surprise to hear that pulling off a conference on this scale – literally thousands of delegates and speakers and exhibitors are involved – is a mammoth task. There were a lot of sleepless nights – partly due to the sheer workload, but also because we undertook a massive consultation that was very enlightening for our team in terms of defining “where to from here.” But we think and hope that we ended up with an event that offered the best of the old GLOBE with some new and improved elements. Admittedly, I am pretty biased in my highlights. After working on cleantech issues for almost 20 years, it was great to see cleantech suppliers and buyers take centre stage at the Expo – and to see cleantech at the centre of a conversation we’re having about global competitiveness and economic diversity. It was pretty clear that Canada has solutions to offer domestically and globally, and that the time to capitalize is now. The Expo was an opportunity for people to kick the tires on the technologies of General Fusion, Saltworks, BioCube and Hatch, to name just a few. Making these solutions real for people at events like GLOBE is the way of the future. You may have heard of General Fusion, but until you see the multi-tonne liquid plasma injector, it’s hard to understand that this is the Buck Rogers of cleantech. Technologies of the future are being developed right here in Canada. That energy and excitement also came from the unprecedented involvement of all three levels of government, something that has not happened for over a decade. Prime Minister Trudeau opened the conference and said, “We must do better. We will because in Canada, better is always possible. Doing better must become business as usual for us all.” There were more premiers and ministers on more panels than I personally have ever seen before, and a real sense of collaboration and partnership between the public and private sectors. Just awesome. We want to keep the conversation going between the GLOBE conferences, and we want to build on the momentum and keep pushing towards a solutions economy. To that end, we’re announcing GLOBE Capital. The concept is still being refined, but the idea is to convene an event that is focused on the intersection of finance, technology, competitiveness and productivity, and is targeted at catalyzing large-scale capital deployment to build the economies of the 21st century. Stay tuned for more information. It’s going to be good. 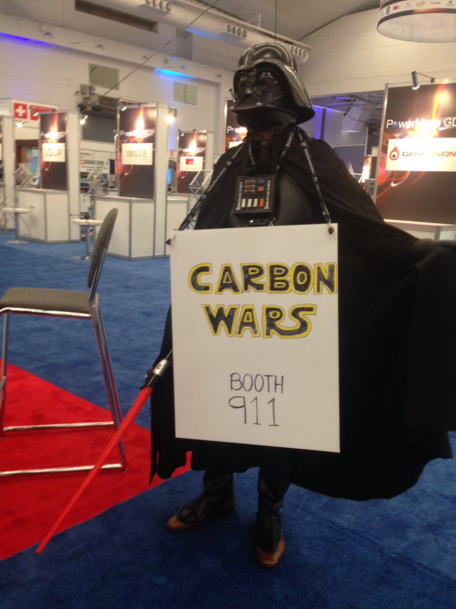 Some of you might have visited the Delphi booth while you were in the Expo and saw that we were offering a prize to the winner of our “Carbon Wars” game. The game was built out of the Delphi TridentTM tool, which is an online platform for identifying your options for reducing carbon at the lowest cost. Everyone that played the game was entered into a draw and the winner was: Jackson Hegland from ARC Resources Ltd.
Congratulations Jackson! He won a greentech prize pack that includes a backpack that will charge a mobile device via solar panels, as well as a bamboo charger and keyboard. May the force be with you! We look forward to seeing you at GLOBE Capital in 2017 and/or GLOBE 2018!